The Delphic embodies features similar to those of the Bel Canto except that it uses two Lowther EX2 drive units. The second is mounted in the upper section of the cabinet and radiates upwards and outward. The disposition of the drive units together with the Ambience Matching facility brings a broad 'panoramic' sense of listening eminently acceptable to today's musical trends. Another special Lowther feature is that there is no cross-over network of any kind between the drive units to degrade the signal quality from the amplifier. Height variable from 125cm to 137cm x 28cm wide x 44cm deep. Black Lacquer or Real Wood Veneer. The Lowther LOGIC SERIES is designed to overcome the severe limitations of the accepted practice of making loudspeaker's rigid and in identical pairs. Such speakers would be fine if all rooms were the same shape and size, identical in all respects and had no room corner or doorway problems to influence the quality of sound reproduction. 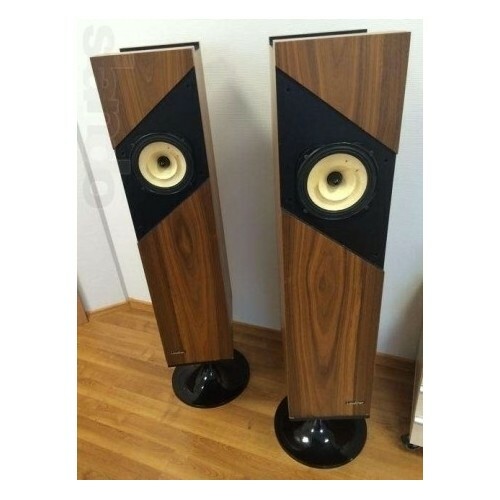 Identical loudspeakers would be fine if we all had identical hearing, enjoyed the same sort of music and had similar ideas about the quality of bass and mid-range presence we preferred. So many of us have attempted to overcome the limitations of fixed, identical loudspeakers by raising them, tilting them, angling them, and even re-arranging furniture and drapes. When we have finally arranged everything to our liking younger members of the family like to rearrange everything to suit their own musical tastes. Virtually all the problems associated with fixed, identical loudspeaker systems are eliminated with Lowther's Logic series. Lowther Logic loudspeakers are immediately and simply adjustable to suit all individual preferences for bass response, mid-range presence, stereo imaging, height and angles. Each loudspeaker may be individually adjusted to emphasize the bass response and mid range presence to suit the listener. It is simplicity itself to adjust the system to suit variations in musical moods and tastes. Unlike rigid systems you are able to tune the speakers to give a perfectly balanced sound stage to suit your individual preference and room ambiance. The Logic series is the perfect solution for the acheivement of perfect sound reproduction. It takes but the touch of finger-light pressure on Logic Series Loudspeakers for them to be accurately tuned to the prevailing ambience of their surroundings to experience vastly improved sound quality. This is because each cabinet can be raised or lowered separately over its base and/or rotated to the correct angle to ensure true stereo and superb sound quality. This system, unique to Lowther's Logic Series is far more accurate and easier than attempting to position the speakers yourself. The shape of the base follows a mathematically formulated tractrix curve to become an integral part of the Bicor-balanced horn system, which greatly enhances the full natural bass response. From time immemorial, horns have served to create or reproduce sound. They became essential when wanting to develop mechanically reproduced sound and reached popularity in the domestic wind-up gramophone (or phonograph). With electronic amplification and moving-coil drive units working with exponential horns, 'high-fidelity' took on greater significance. Lowther pioneered much original work in developing air loaded horn reproducers for which they remain world-recognised authorities. Another Lowther exclusive. Its application to Lowther's labyrinthine horn formations has been to eliminate the barrier effect of standing waves in horns completely, leaving cleaner, clearer musically transparent sound as a consequence. Patented throughout the world, the ?Hi-Ferric'? process used exclusively in Lowther Drive Units contributes yet still further to performance standards. Electronic control of the movement of the speech coil produces unbelievably good separation between vocal and instrument sound that can at best be compared only to the original performance. Above everything, it has to be the design and performance of Lowther Drive Units upon which their universal acceptance for excellence rests. Their manifest superiority is amply demonstrated in the outstanding quality attained by reproducers in the Logic Series range. That Lowther do not use crossover filters between drive units to sustain balanced response over the audio spectrum testifies to the value of their design philosophy throughout.